I have always wanted to personally source a good quality Yiwu tea. 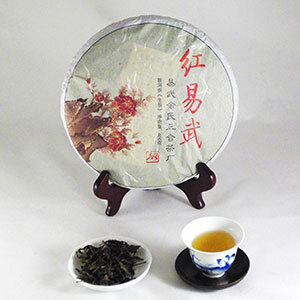 Pu-erh from Yiwu tea is my favorite because of its softness, its unique plum flavor and its balanced energy. The "Yiwu charm" is a sensory experience that can readily be felt but is almost impossible to describe in words. Sourcing Yiwu tea is particularly difficult not only because of its high price but its authenticity. During my trip in 2014 to Yiwu, I visited the Yu family in San He Village, whom I have known since 2009. The Yu family has their own ancient tea garden. Their trade mark "Red Yiwu" refers to teas produced from their family tea garden. I purchased a small amount of their tea in 2009 and it remains one of my favorites. On this trip, I was able to source a limited amount of their 2014 edition to offer to Bana customers. This tea is soft and silky, yet rich and durable. The plum flavor typical of teas from the Yiwu region is the most charming and attractive aspect of this tea. Even though this is a very young tea, the bitterness is well-balanced and it dissipates quickly into a pleasant sweet after-taste that lingers. Use 5g of leaves per 5-6 oz of water. Rinse with 185 degree F /85 degrees C water prior to brewing. Follow the suggested steeping times below.